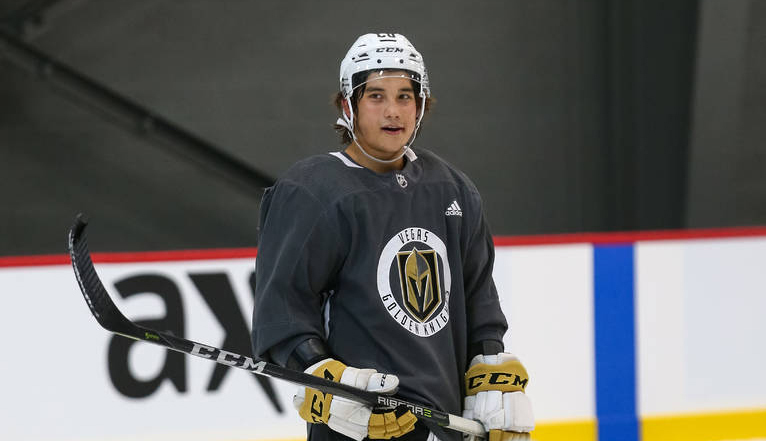 September 2017 – What a debut by Tyler Wong, in his first pre-season game Wong records the first Vegas Golden Knights hat trick. Wong finished the game with three goals and an assist leading the Golden Knights to a 9-4 victory. It is the first ever Golden Knights game, so the hype is going to be there, but Wong is playing like he has been fired out of a cannon. Let's see if it earns him a contract and an extended look through preseason. Tyler Wong currently is signed to an AHL contract with the Chicago Wolves. Wong played the previous five seasons with the lethbridge Hurricanes, serving as captain the previous two years. Wong put up 109 points (51-58) in 69 games last year and still went unsigned. The main reason has to be his size, 5'9" 172 lbs. Wong is showing he is more than just a "small" player. He has hands, speed and can finish plays like a pro. If Wong is fighting for a spot in the Golden Knights lineup and is making it difficult on Vegas management to keep him in Chicago. Tyler Wong is proving he deserves an NHL contract. Keep an eye on him to make a splash out of training camp and preseason.